A welterweight title fight featuring reigning champion Tyron Woodley defending his title against undefeated challenger Darren Till headlined last weekend’s UFC 228 event in Dallas. UFC welterweight champion Tyron Woodley could potentially be defending his title against Nate Diaz at UFC 219. Earlier today BJPENN.com’s Chris Taylor confirmed that Nate Diaz had started a new fight camp and was closing in on a deal which would see him return at the December 30 event in Las Vegas. This evening MMAFighting’s Ariel Helwani confirmed that a bout between Woodley and Diaz was being discussed by UFC officials but that no deal has been reached as of yet. Nate Diaz has not competed since UFC 202 where he suffered a majority decision loss to current UFC lightweight champion Conor McGregor in a bout contested at welterweight. “The Stockton Slugger” had previously defeated “Mystic Mac” at UFC 196 by way of second-round submission (rear-naked choke). 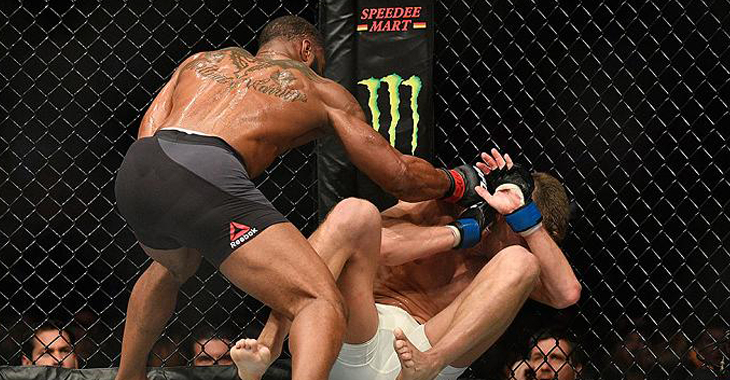 Meanwhile, Tyron Woodley was most recently seen in action at July’s UFC 214 event in Anaheim, where he successfully defended his title against submission specialist Demian Maia. “T-Wood” has gone 5-0-1 over his past six octagon appearances scoring wins over Dong Hyun Kim, Kelvin Gastelum, Robbie Lawler, Stephen Thompson and the aforementioned Demian Maia in that time. Woodley’s last loss came way back at UFC 174 in June of 2014 when he was outpointed by former title challenger Rory MacDonald. Who do you think will emerge victorious if Tyron Woodley and Nate Diaz square off for the welterweight title at UFC 219 on December 30 in Las Vegas? Former UFC welterweight kingpin Georges St-Pierre (25-2 MMA) was originally slated to make his long awaited octagon return this summer in a middleweight title fight opposite current division champion Michael Bisping. Unfortunately for fight fans hoping to watch “Rush” square off with “The Count”, the proposed fight was delayed due to a lingering eye injury suffered by the Canadian star. Now it appears that Michael Bisping vs. Georges St-Pierre bout has been scrapped entirely as UFC president revealed to MMAJunkie that the promotion has a new plan for the former welterweight champion of the world. News broke earlier this evening that current welterweight title holder Tyron Woodley would be defending his title against top division contender Demian Maia in the co-main event of UFC 214 on July 29 in Anaheim, California. With that said, Georges St-Pierre will now meet the winner of the newly announced Woodley vs. Maia matchup. The timing would work very well for “GSP” to return to the cage against the Maia vs. Woodley winner at Madison Square Garden this November in New York. St-Pierre was last seen in action at UFC 167 in November of 2013, where he earned a split-decision victory over Johny Hendricks. “GSP” will return to action riding a current twelve-fight win streak, which includes victories over Nick Diaz, BJ Penn, Carlos Condit, Matt Serra, Jake Shields and Matt Hughes just to name a few. What do you think of the news from UFC president Dana White?